A new Canon patent appeared today, according to the patent the camera the upcoming Dual-pixel AF CMOS sensor will carry built-in ND filter. 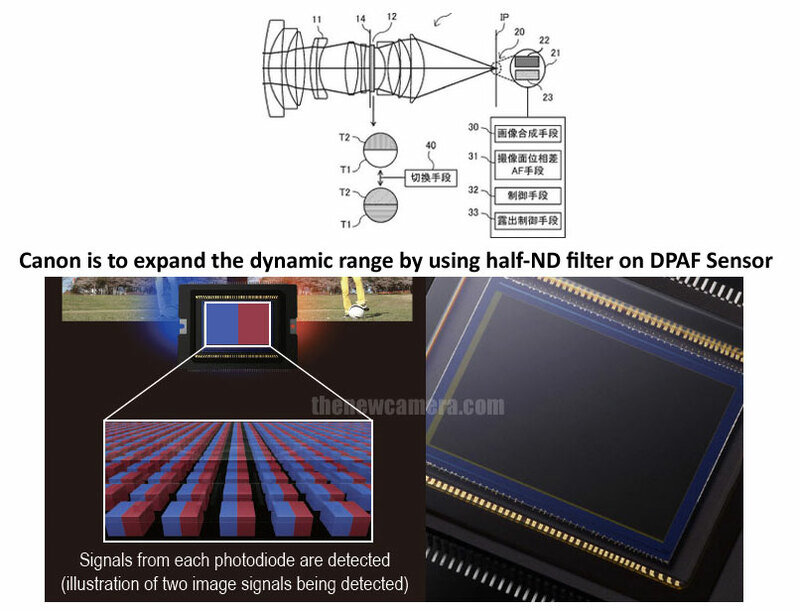 As we know that the with Dual Pixel CMOS AF, the amount of lens drive is calculated from the amount of signal difference (amount of shift) in the AF points. When the signals of two photodiode are in agreement the Focus is achieved. Now according to the patent one (1) of the photodiode will have ND filter and another one will not… in that way the half of the sensor photodiodes will have ND filter and half of of them are normal pixels and it depend upon users to switch on normal of ND filter mode… this tech will help to expand the dynamic range of the camera. Canon is working too hard on latest technologies , we have already seen many multilayer sensor patents from Canon …. see – Canon New Multilayer Sensor Patent , Canon Multilayer Sensor Rumors and also see our old article What to expect from Canon ? If you have better translation do share with us.